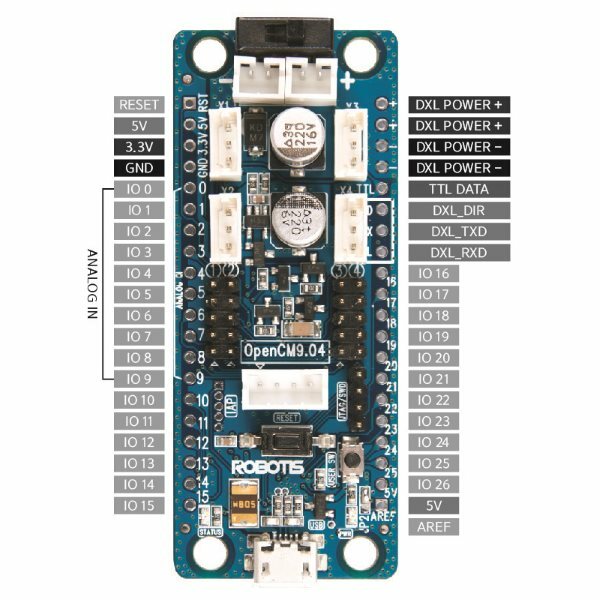 The Robotis OpenCM9.04-C is a small robot controller featuring Dynamixel XL Smart Servo connectors and a 32 bit ARM Cortex M3 processor. The OpenCM 9.04-C has an STM32F103CB 32 bit ARM Cortex-M3 microcontroller with 128K bytes of Flash, 20K bytes of SRAM and full set of GPIOs. 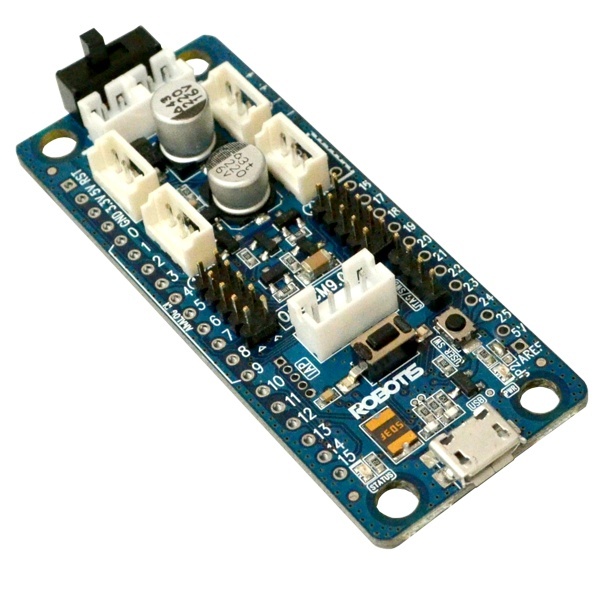 This robot controller features four 3 pin Dynamixel TTL Bus connectors for use with Dynamixel XL series smart servos. It also has four sets of 5 pin male header sensor ports, UART, JTAG/SWD Serial Wire Debug, Micro USB. 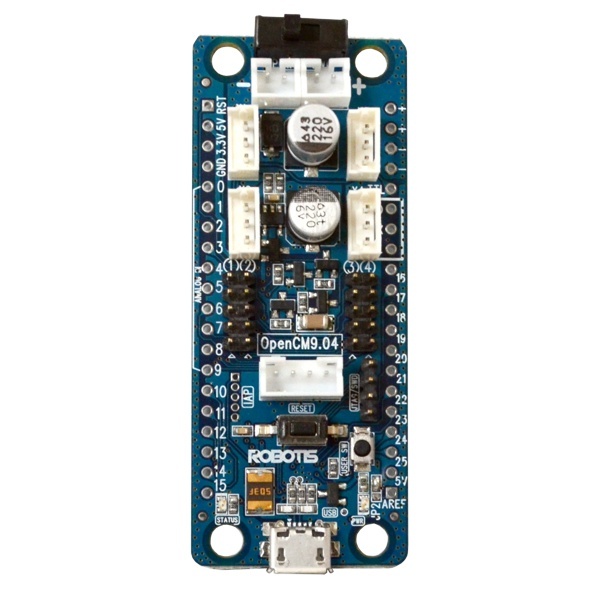 This robot controller offers a full set of GPIOs available via a set of solder pads. There are 26 GPIOs which include up to 10 analog inputs, 13 PWM channels, 2 USARTs, 2 SPI channels and I2C. A built in user LED and button are available to general use. A power indicator LED, reset button and power switch are also provided. Develop C/C++ programs using the Robotis OpenCM IDE Integrated Development Environment and load them onto the controller via USB. 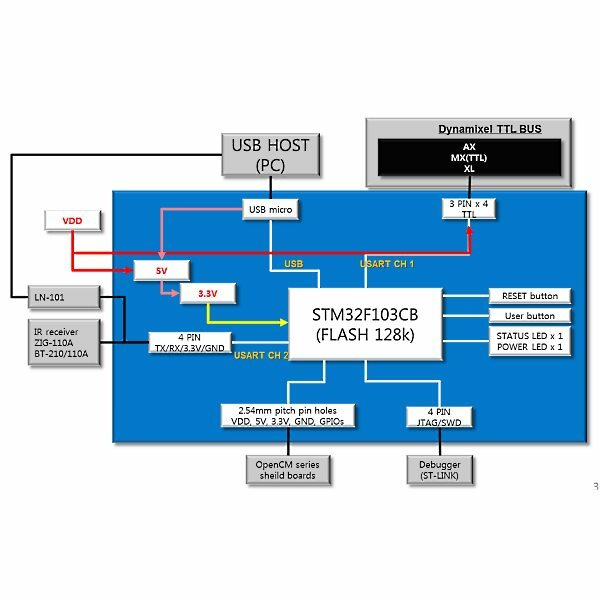 A handy JTAG/SWD debug port provides industrial strength hardware debugging to maximize productivity. The OpenCM 9.04C robot controller operates at 3.3V and requires a 5V- 16V input power source. 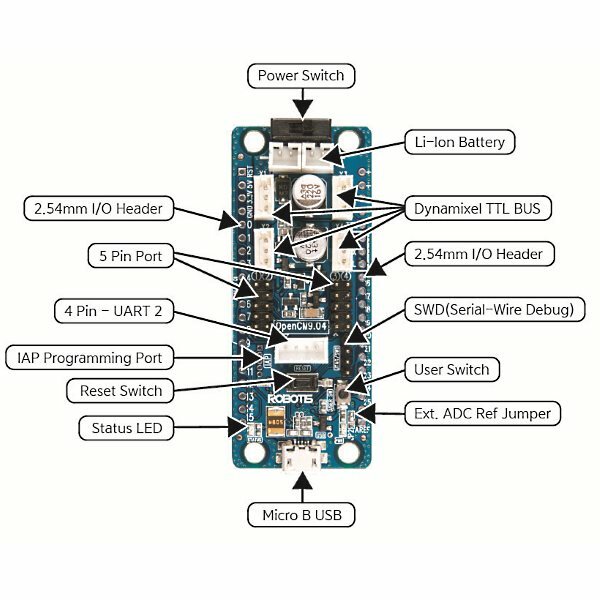 It can be powered by USB for programming and experimentation but requires a separate power supply when driving Dynamixel Smart Servos and other parts. This package comes with a set of optional male and female headers for maximum flexibility. A micro USB cable is also included. Downloadable software is available for Windows, Mac and Linux.